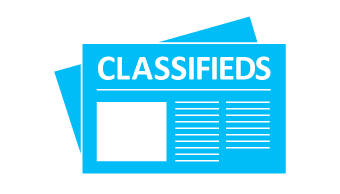 IN EARLY November Metropolitan Mayor Daniel Butler put out a call on Twitter looking for help to identify a list of unsung heroes of the local music scene. 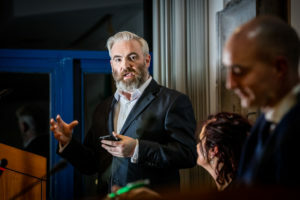 From there followed some extensive research both online and offline into Limerick individuals in the background making music happen in the city in various ways. After lots of “discussions and heated debates,” says Mayor Butler, the list was whittled down to four people. 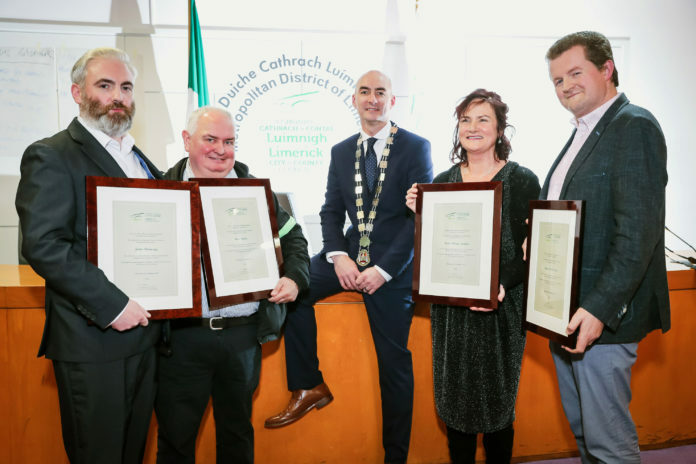 On Thursday last, Máire Keary-Scanlon, John Hennessy, Shane Curtin and Ber Angley were honoured by the city. A large crowd from the music community in Limerick came out in support at the event at City Hall. The speeches made on the night highlighted how these people had contributed to the musical landscape of the city for many years. The Mayor commented that he is a huge music fan and highlighted why he organised this event. “Growing up as a massive music fan and attending gigs in the city over the years, you go see the act that is there and you forget about all the people in the background who made that happen for you, who made that moment for you. 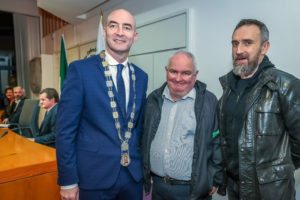 Mayor Daniel Butler, Ber Angley and Noel Hogan from The Cranberries. Ber Angley is synonymous with events / entertainments at University of Limerick since the 1980s. He is also a documentary maker and DJ and is highly regarded in the music industry. Ber brought many acts to the college in Limerick and put the city on the map as a destination for international acts: Lene Lovich, Ned’s Atomic Dustbin, The Wedding Present, to name a few. John Hennessy books and promotes live gigs in Dolan’s under the moniker Seoda Shows. The Limerick man worked at Whelan’s Dublin as booker for many years before returning to the city where he was persuaded by friends to book music into Bourke’s Bar and afterwards, joined Mick Dolan and team on the Dock Road. Seoda Shows has booked Thurston Moore, Grant Hart, Andy Irvine & Paul Brady, Rusangano Family, and Panti Bliss and more recently Fontaines DC, Girl Band and The Murder Capital for memorable shows across the city. 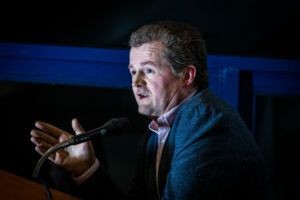 Mick Dolan praised John’s instinct for finding cutting edge artists and booking music acts that are about to blow up in the music scene. “He is an exceptional character and when John books a gig, you know it will be a good gig. Máire Keary Scanlon is synonymous with music and choirs in the city. She studied music in the Limerick School of Music, on piano and organ, studied singing Dublin College of Music and attained first class honours in Choral Direction at Trinity College. It would be easier to list the choirs and musicals she has not worked on, such is the long list of credits and awards for her choirs and personally herself, as choral director. She is a founder member of the Children’s Choir Cantette and multi award winning women’s Chamber Choir, Seoda. Now working at the Irish World Academy of Music & Dance in UL, Máire was praised for the huge volume of work she does for choirs and musicians in the city – a patient and calm teacher who brings her students along, getting them to reach full potential. In accepting her award Máire told a sweet story that encapsulated the dedication and love of music that all four recipients and everybody in the room could relate to. Talking about her upbringing, Máire told attendees that she grew up in a house where music was ever present. Shane Curtin has been involved in promoting hip hop and reggae events in Limerick since the mid 90s. He founded the award winning music blog Sheeba and now has lent his vast experience to the annual Make A Move Festival of Hip Hop Culture for the last seven years. From his early days broadcasting hip hop on Wired FM, Shane has been passionate about the upcoming and under-represented in music, spotting people and places across the city where events can take place. Much of the groundwork done by Shane and other volunteers in the hip hop scene have succeeded in changing the perception of rap music in the city to one of expression and art. Workshops in Music Generation Limerick and new indie labels, Unscene and Prescription are producing phenomenal talent which has “collectively boosted the image of Limerick,” commented Tarpey. Limerick/ Clare hip hop trio Rusangano Family who won the Choice Music Prize for their 2016 album ‘Let the Dead Bury the Dead’ is a case in point. Expect plenty more success stories from these unsung heroes in 2019!